Farm Theme Birthday Party Supplies to Decorate a Little Farmers Fantasy. 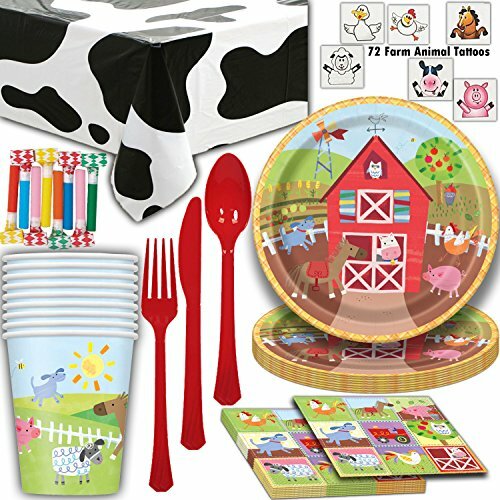 Featuring a classic red barn with an assortment of animals including a cow, pig, and more, these party supplies won't disappoint. The temporary tattoos and blowouts are perfect favors to make it all more exciting. See description for detailed list of all included items. Mr. Nice Toy 36 Piece Forest Animal Set Assortment 1.5" to 3" figures"Styles May Vary"
Baby Shower Party Decoration Set for Boy. All-in-One Bundle Kit with "It's a Boy" Plates, Napkins, & Garland. Animal Cups & Table Cloth Included.